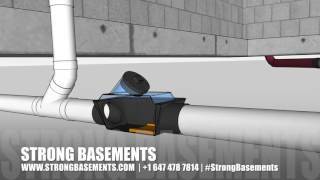 Basement Flooding Protection services in Toronto & GTA! With heavy rain, snowfall, and the thawing of the ground in spring, flooded basements can quickly become a homeowner’s worst nightmare, particularly if you live in a region that is geographically low-lying. Basement flooding is a prevalent issue among homeowners, and can cost upwards of several thousand dollars in repairs, while often damaging personal items and the interiors of homes beyond recovery. However, basement flooding is entirely preventable through the proper installment and upkeep of plumbing and drainage systems within and around your home, each of which plays an essential role in protecting your home against basement flooding. What makes a home susceptible to basement flooding? Any home with a basement has the potential to become flooded, as groundwater around the home can seep into its walls and foundation, causing them to crack. Your home’s surrounding groundwater can also cause basement flooding when the foundation drains fail, or from sewage backup. Because of this, a proper drainage system such as a sump pump and backwater valve are a crucial components in basement flooding protection. Drainage systems such as the sump pump work through the collection of groundwater which they then pump away from your home, thereby preventing its flooding through a carefully controlled drainage system. This system can help protect your basement against flooding from both sewage and groundwater, thus making it one of the most efficient means of basement flooding protection. How to protect Your Basement and prevent it from Flooding ? While the threat of basement flooding is never completely avoidable, proper basement flooding protection can greatly increase your home’s chances of withstanding a basement flood. Such precautionary measures will not only give you the peace of mind in knowing that your home is protected, but will greatly reduce your chances of flooding. Other measures you can take to ensure basement flooding protection include: sealing any cracks, holes, or openings you may find in your home’s basement and foundation, sealing off window wells and ensuring your sump pumps are draining properly and well-maintained. However, with the rising costs of housing, smart homeowners know that investing in a proper drainage system and basement flooding protection will pay its way in the long run. It is therefore important that homeowners looking to protect their homes against basement flooding do their research in order to find a reputable and experienced contractor who will install their basement flooding protection properly. Together we can stop heavy rainfall, melting snow and run off from ending up in your basement.